Monday’s 70th annual prime-time Emmys telecast is history. Or perhaps you thought you were watching Saturday Night Live. Amazon Prime’s The Marvelous Mrs. Maisel ended up as best of show with five wins while Netflix edged HBO for network bragging rights by winning seven trophies to the longtime champ’s six. Otherwise, a cavalcade of past and present SNL stars paraded through the three-hour telecast, which was produced by SNL maestro Lorne Michaels. The show’s current-day “Weekend Update” anchors, Michael Che and Colin Jost, hosted the ceremony, in which Michaels and alum Bill Hader (for HBO’s Barry) both emerged as winners. Their onstage appearances were unplanned. But even without those two, the SNL presence was pervasive. Acting as presenters, sketch participants or both were Kate McKinnon, Andy Samberg, Aidy Bryant, Maya Rudolph, Fred Armisen, Tina Fey, Tracy Morgan, Leslie Jones, Alec Baldwin, Kenan Thompson, Will Ferrell and Ben Stiller (yes, he was briefly a cast member in 1989 before quitting after four shows). That’s not counting Amy Poehler’s appearances during commercial breaks on behalf of her NBC comedy series, I Feel Bad. 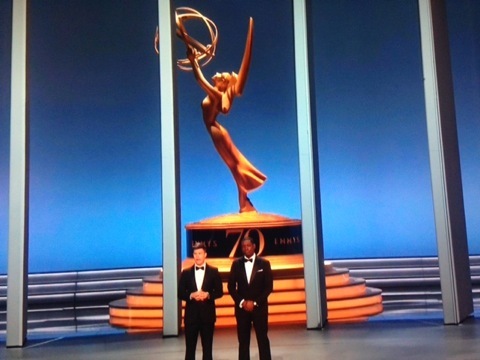 Ferrell and Thompson were chosen to present the telecast’s two biggest Emmys in the climactic closing minutes. Thompson also participated in an opening sing-along, “We Solved It,” tied to the efforts to bring diversity to the show’s long lists of nominees. Rudolph and Armisen were sprinkled in and out as erstwhile experts on the history of the awards. But their bits played dead throughout. Betty White’s appearance, at age 96, drew the night’s longest ovation. “Oh my goodness, goodness, goodness,” she said, basking in the audience’s affection. “It’s incredible I’m still in this business.” She also thanked Michaels for inviting her, and for making her one of SNL’s hosts during the 2010 season after a Facebook campaign on her behalf. The most memorable acceptance speech went to Oscars director Glenn Weiss, who won ABC’s lone Emmy. Noting that his mother had passed away just two weeks earlier, he then proposed to his girlfriend, Jan Svendsen, who took the stage and accepted the ring Weiss offered after he said it was the same one his father had put on his mother’s finger 67 years earlier. Awwwww. The awards also had a memorably touching “In Memoriam” segment, with the late, great Aretha Franklin doing a voiceover of “Amazing Grace” while the selected deceased were feted. John McCain, whose 2002 hosting of SNL recently re-ran on NBC, was pictured second to last before Aretha herself got the final mention. Henry (“The Fonz”) Winkler , who came to fame in Happy Days, kicked off the night in rousing fashion by winning the night’s first Emmy (and his first as well) for a supporting role in Barry. “I only have 37 seconds. I wrote this 43 years ago,” he joked after an enthusiastic response. Mrs. Maisel’s win was foreshadowed in the early going, with the Amazon comedy series winning four of the first five Emmys, including two for director-writer Amy Sherman-Palladino and one each for star Rachel Brosnahan and supporting actress Alex Borstein. Down the homestretch of the ceremony, chances for FX’s The Americans also seemed promising after Joel Fields and Joe Weisberg won for their writing and Matthew Rhys received the best actor in a drama series award. But for the third time, the big prize went to Game of Thrones, which will have its final season next year. FX’s top Emmy winner was The Assassination of Gianni Versace: American Crime Story, which received trophies for best limited series, Darren Criss’ lead performance and Ryan Murphy’s directing. Netflix’s league-leading seven Emmy wins were sprinkled among The Crown, which received two (including a best actress nod to Claire Foy); Godless (2); Black Mirror, Seven Seconds (an acting win for Regina King); and John Mulaney: Kid Gorgeous At Radio City. RuPaul’s Drag Race, named the best reality competition program, gave VH1 the only cable network Emmy not won by HBO or FX. Streamers Netflix and Amazon equaled cable’s total of 12, which again left the Big Four broadcast networks in almost total eclipse. CBS and Fox were shut out while NBC and ABC limped home with the aforementioned one trophy apiece. A later “Reparation Emmys” short film had Che presenting awards to previously unrecognized African-American comedy stars, including Marla Gibbs, Jaleel White and Jimmie Walker (whose first name was misspelled “Jimmy” on screen). Those who want “politics” kept out of awards shows likely weren’t mollified Sunday night, although President Trump basically went unmentioned -- at least in a direct way. But fans of SNL got more of what they were looking for -- and then some. For a complete list of Emmy winners, go here.